Between one–third and one–half of young adults with mental health challenges have co-occurring substance use issues. This issue of Focal Point examines treatments and supports for this population. 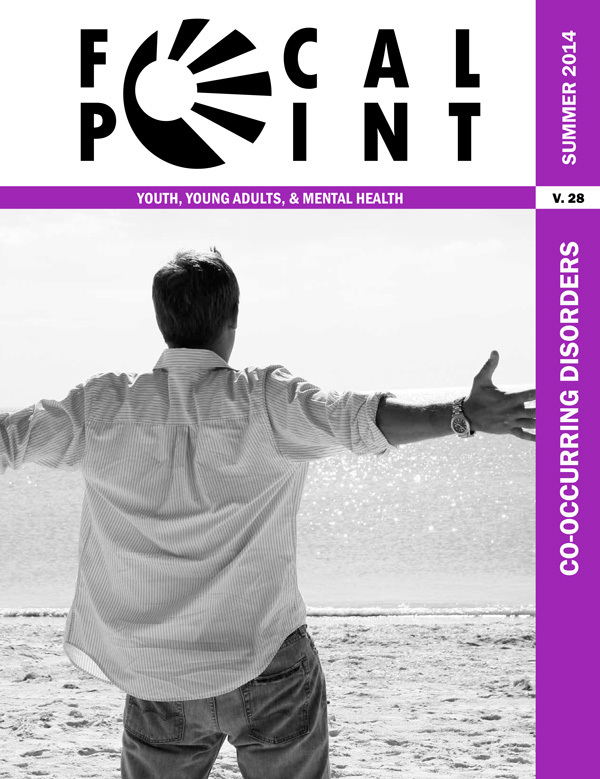 This introduction examines the two main themes that emerge from the articles in this issue ofFocal Point: the need for formal and informal support, and for policies that support access to effective treatments. A parent describes how her involvement in her daughter's treatment plan informed her daughter's journey from attempting suicide to leading a fulfilling life. This article provides an overview of Collegiate Recovery Programs, which create services such as peer support and specialized housing on college campuses that promote abstinence from alcohol and other drugs. Data Trends: Treating Young People with Co–Occurring Disorders: What Works? This Data Trends outlines the effectiveness of two programs designed to treat co–occurring disorders: cognitive behavioral therapy with motivational enhancement therapy, and 12–step programs. Pathways' social media consultant tells how Pathways' December 2013 mental health meme contest created connections among youth participants. A young adult describes his recovery from childhood trauma and drug addiction to become a certified peer support specialist, youth advocate, and artist. This article describes the methods and successes of the Reclaiming Futures program, which helps treat substance abuse and reduce recidivism among incarcerated young people. A parent offers her experiences and thoughts on supports, policies, and services that promote recovery and successful transitions to adulthood. This article enumerates ways in which the ACA and MHPAEA have the potential to improve access to and quality of services for youth and young adults with co–occurring disorders. This Data Trends describes research on disparities in access to and quality of treatment for co–occurring disorders among ethic/ racial minority youth.